Shape Beats is a simple and fun way to learn how to play drums. 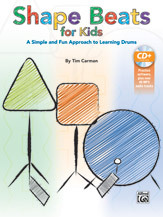 Because many beginning students are still in the early stages of development and may not be able to comprehend standard drum notation, the book utilizes shapes---an instantly recognizable notational vehicle---to teach students basic drum beats. Each chapter contains play-along examples so the student can use their new beats to play along with the songs.